Last year’s release by Fragor Games tells you exactly what it is right there on the box: A Game of Gnomes. It is indeed a game, and it is about gnomes. And it has nothing at all to do with the novels or the TV series of a similar sounding name. That is purely coincidental. A Game of Gnomes is only about gnomes and their struggles with the season, because the cold season is approaching. The first thing you notice about A Game of Gnomes, even before opening the box, is the sheer size of the box. It has about the same footprint as a standard box, but is a bit more than twice as high. The reason for that becomes obvious pretty quickly when you open the box: Fragor Games’s famous game components. 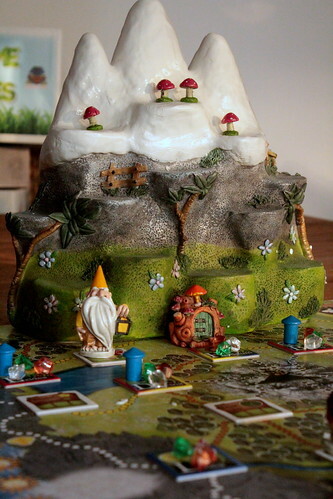 There are the beautiful ceramic gnomes, including one riding a frog, some ceramic mushrooms and two ceramic tunnel doors, but when it comes to size all of that is overshadowed by Mount Gnome, a twenty-odd centimeters high ceramic piece that graces one end of the board with no other reason than to be climbed. Appropriately, step two in the setup instructions is “Place the mountain on the space marked on the board. Go ooh and ahh for 15 minutes.” I love Fragor’s rulebooks. So I guess I made it clear that the components are pretty impressive, but what about the game? A Game of Gnomes is a pick-up-and-deliver game. Players move their gnomes along the paths of Gnomeland to collect mushrooms which they can sell in other places to earn gems, and gems are what gives you victory points at the end of the game. Sounds easy enough, and the rules to do it are easily understood. Collecting and trading mushrooms well, however, is not quite so straightforward thanks to the games movement mechanics. 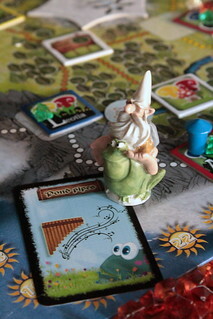 The paths on the board go through different kinds of terrain – meadows, forests and mountains – and for each terrain there are matching cards that you play from your hand to travel there. So far, so good, but cards are not the only resource you pay to travel. The bigger issue is time. Each card that you play to travel costs you time, one week for a single step card, two weeks for a double step, and two weeks as well to take one step with a wildcard that works on any terrain. Lacking cards that let you go where you need to, you can also play cards worth three steps on any terrain to take one step on any path, but you pay the time for all cards used. A trip can take a long time this way. And taking a long time is a problem, because at most you can spend seven weeks in one round. Moreover, at the end of a round the turn counter advances by as many weeks as the busiest player has spend this round, and the game ends after a total of 52 weeks. So make the best use of your time, plan your routes efficiently and make the best use of your cards. But the time it takes to do things is still not the full extend of your problem. Those cards you play to travel? You don’t just draw a fixed number per turn. You take them for sleeping at the end of a round. The fewer weeks you spend doing things the more you get to sleep, and the more cards you get to pick up. And that’s your real problem in A Game of Gnomes: you want to make the most of your time and travel to different places, but at the same time you want to sleep and take cards. Well, that and the snow season drawing near, that’s your other problem. Now that you know how to travel, where can you actually go? 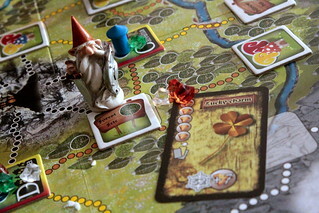 Most locations on the board – which are randomly put on the board spaces in setup, so the board looks different every game – are gnome towns. Those towns grow mushrooms, different colors in every season, and they buy mushrooms, but never of the same color they grow themselves. That would be pretty dumb, right. You can spend one week to pick a mushroom – must be more complicated than a city boy like me would imagine – and then sell it somewhere else without spending more time. Selling, by the way, is less profitable the more mushrooms were already sold in a town, so where you go to do business is another important consideration. Three other locations on the board are shops were you invest your gems in gear. Here you get things like larger baskets to collect mushrooms, because your basic gnome basket only holds one, or bigger backpacks to increase your hand limit. Other items let you travel through one terrain without cards, only using one week per step and nothing else, or let you travel down the rivers on the game board. Next to those useful things you also find luxury items like the Gnomish Beardcomb – never leave home without it. These treasures have a high price in gems, but at the end of the game they are worth even more gems for your final score. Their big downside is that, unlike the more useful cards, they count against your hand limit. Oh, and what would a good fantasy game be without quests? You can travel to the Sorcerer’s Tower in the Tangled Wood – that’s his actual mail address, it’s a pain to fit on the envelop – where the sorcerer is always looking for a helping hand. Quests are mostly simple, like visiting another gnome’s gnomehome or buying at a certain shop. The sorcerer pays in advance, too. But don’t think you can take the payment and run, if you end the game with unfinished quests they cost you a lot of gems. The rules explain that those gems are the price for an invisibility spell strong enough to hide you from the defrauded sorcerer. Fickle and quick to anger indeed. Which leaves us with one location to travel. The elephant in the room, if you will: Gnome Mountain. The mountain is not so much a location as it is another game board. It has three levels, and each level has a number of spaces. To move between spaces on one level you play cards as usual. To move up or down you need a map, another item you buy at the shop. You usually need two maps to get to the top, one to go from bottom to middle and one from middle to top. That’s a lot of effort just to climb a ceramic mountain, but it’s worth it. The view from up there is… oh, forget about the view. At the top of the Gnome Mountain is where the rare and expensive Montane King Mushroom grows, and if you can get one of those to a town you’ll be richly rewarded. Yeah, it always comes back to mushrooms. And when the game ends after 52 weeks, victory mostly depends on who sold the most expensive mushrooms. Strategy-wise, there is just no way to avoid mushrooms. That is one thing that bothered me about A Game of Gnomes, there are always mushrooms. The publisher blurb reads like you have exciting alternatives: work for the sorcerer, or climb Gnome Mountain, or sail a leaf boat down the river. Well, you have all those options, but none of them will do you any good if you don’t also enter the mushroom trade. I don’t even hate the mushroom trade, I’m just miffed that I was led to believe I could do those other things as alternative ways to victory, not just as add-ons. I’m also missing some interaction between the players, pretty much the only way to interact is selling mushrooms in a town before other players can, and then they have no way to stop you, anyway. In theory, you can also push them off the mountain, but that rarely happens, and when it did for us it destroyed the victim’s game. Not too happy with how that turned out. Enough griping, though, what about the good parts of A Game of Gnomes. While it is a pick-up-and-deliver-mushrooms game, you have a lot of tactical choices to make. What is the best route to travel, what gear is worth buying, which quest can you complete, and when is a good time to use your once-a-game-only riding frog and really go places? And, of course, when is a good time to sleep? The thing I love most about A Game of Gnomes is the time/sleep mechanic. You want to do all you can to score points, obviously, but the more you do the fewer cards you draw. That creates a good tension between doing a lot and saving resources. And then, of course, there are the components. The board and tiles are actually not particularly pretty, but the gnomes might just be the prettiest game pieces I ever played with. And then, of course, there is the mountain. It’s not just a huge piece of decoration, you actually play on it. How awesome is that? I mean, of course it could have been a section printed on the board instead, but which part of giant ceramic mountain to play on am I not making clear? I don’t think A Game of Gnomes is the best Fragor game, it doesn’t keep up with Spellbound or Mush! Mush!, but it is a solid game and I’ll happily play it again. And it delivers what Fragor always sets out to deliver: a fun game with unnecessary, ridiculously overproduced but oh so pretty components. Just look at the gnome riding a frog. Look at it! That’s all I have to say. Now, when will Fragor Games announce their game for this year?